My sunburn fiasco last summer taught me that when it comes to sun protection sometimes, melanin just ain’t enough. Memories of dealing with weeks of peeling skin have steered me onto a new journey; my quest to find the perfect sunscreen. I started my search off by focusing on finding the ideal facial sunscreen, looking particularly for those with my three preferred properties: broad spectrum UVA/UVB protection, non-comedogenic and no white, blue or grey cast formation. The non-colour cast forming sunscreens i.e. the melanated-skin friendly ones, tend to lean towards the formulas containing chemical sunscreens rather than the physical sunscreens but I’m sure with newer nanoparticle formulas there are many exceptions to this. Whilst working through recommendations from friends, beauty sites and product reviews I’ve stumbled across a few noteworthy facial sunscreens, ranging from SPF15 to SPF50 and all black or brown skin friendly. One of my all-time staples is the Olay Complete Sensitive Day Cream with SPF-15. At around £5 for 50 ml, this is a low-cost nourishing cream with broad spectrum UVA/UVB protection enriched with vitamins B3, E and Pro-V B5. It leaves the skin feeling moisturised and soft throughout the day – I use this all year round and feel that it’s at its best during the winter months. 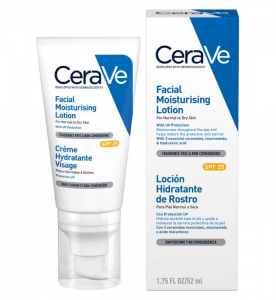 The 52ml £12 CeraVe Facial Moisturising Lotion with SPF25 is a fragrance-free and non-comedogenic lotion. It’s packed with goodies such as ceramides, niacinamide and hyaluronic acid. It has a richer texture but sinks into the skin quickly without leaving a sticky or oily finish. This lotion was fantastic as it didn’t give me any spots, but it doesn’t specify how much UVA protection, if any, it offers. The least expensive of the SPF-30 products is the 50ml £6.99 Simple “Kind to skin+ protecting moisture cream”. It’s a rich, fragrance-free cream that absorbs into the skin fairly quickly. It contains both chemical and physical (titanium dioxide) sunscreens as well as goodies such as vitamin B3, vitamin E and almond oil. Importantly, it offers both UVA and UVB protection. 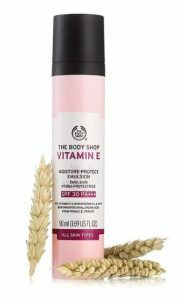 The Body Shop Vitamin E range offers a lightweight mildly scented sunscreen lotion with UVA and UVB protection for £15 per 50ml bottle. It’s a lovely product to apply, pleasantly fragranced and really hydrates the skin. But if you have oily skin, I do feel you have to be cautious as it can leave a slightly oily feel depending on how much you apply. I would recommend waiting around five minutes before applying make-up and would suggest using this alone without any other moisturising products. 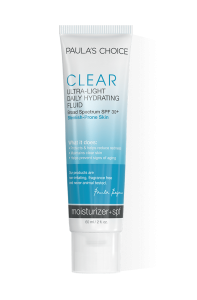 Finally, the Paula’s Choice broad spectrum ‘Clear Ultra-light daily hydrating fluid’ is a very light fragrance-free liquid that blends into the skin beautifully, leaving a hydrated but non-tacky and non-oily finish. It’s packed with key ingredients such as vitamin E, green tea extract, oat bran extract and more. Like the Body Shop’s website, the Paula’s Choice site is informative and provides information on the benefit of each ingredient in the formula. At £33 it’s on the higher end of the price range but does offer 60ml of product. Ramping things up to the SPF-50 lotions, the MAC prep + prime Face Protect Lotion is a gem. According to the MAC website, it offers broad spectrum UVA/UVB protection and is a non-acnegenic formula. I purchased this some time ago, but apparently people have hinted online that they now have a new formula. Based on the version I have, it’s a medium consistency lotion which initially comes across as though it may be oily, but give it around 5 minutes to sink in fully. My foundation applies well over this sunscreen. At £25/per 30 ml bottle I’d say this is worth it if you’re requiring maximum SPF cover. The Heliocare Advanced gel SPF50 is a broad spectrum UVA/UVB sunscreen designed to be non-comedogenic. I’ve read lots of glowing online reviews about Heliocare sunscreens. This particular product is a beige-coloured “gel” containing a combination of physical (nano titanium dioxide and zinc oxide) and chemical sunscreens. In my experience, I found that although it didn’t give me an obvious grey tinge, it did make my skin appear slightly dull. It also occasionally formed tiny balls of product on my skin which I had to dust off and it was difficult to pinpoint exactly what caused this to happen. When left to dry for a few minutes it provides a smooth, soft and non-greasy feel to the skin and my foundation sat nicely and matte over it. But, at roughly £19 per 50ml tube, I’m unlikely to repurchase this product, though I’d happily try another sunscreen from the Heliocare brand. Finally the Body Shop Skin Defence Multi-Protection Essence is described as a “lightweight milk-to-water essence” which contains red algae extract and vitamin C. Again, this is a gorgeous product, designed to be non-comedogenic. It blends effortlessly into the skin and has a light pleasant fragrance. It leaves a moisturising, soft and non-oily feel to the skin. I think it’s worth the £17/40 ml price tag. Overall, the majority of these products hit the mark in terms of providing broad spectrum protection and freedom from the notorious white-cast, however throughout this process my one overarching problem has been that of breakouts. So, I had a eureka moment and decided to read through all the ingredient lists to find the pesky perpetrator and finally worked out that it’s the ethylhexyl methoxycinnamate that causes my spots. …and, it took me trying out eight different products and spending over £100 to figure this out. This explains why the Olay and CeraVe creams were the only sunscreens not to give me any spots (as they don’t contain this ingredient) and funnily enough, why I had to stop using my beloved Lancome Teint Idole foundation last year to my dismay. This isn’t a call to boycott ethylhexyl methoxycinnamate; it might work absolutely fine for you, or if you’re getting spots the cause may be an entirely different ingredient. It just means I now know to avoid sunscreens that include it – and my search for the perfect SPF 30 – 50 continues.